Doing some more catching up on my blog writing! During one of the last weekends in April, I took my first solo traveling trip, as well as had my first solo couch-surfing experience. And where may you ask was my normal partner-in-crime, Nazli? – oh, she was off gallivanting in Greece for 2 weeks so I figured, “Well I’m not going to stick around here!” (Ok, also she has already been to Rome like 4 times and gave me that whole “been there, done that” speech so…I was on my own, but still keeping my vagabunda swagger! And the whole trip almost never happened as I just about missed by plane. After the bus arrived late in my town, I then missed the train into Barcelona, which then made me miss my original train to the airport. Ended up putting me about 1 and 15 minutes behind schedule (now remember folks, with Ryanair, you print your boarding pass at home, security takes 10 minutes and then there is always a huge line at the boarding gate…in other words, getting there about 1 hour ahead of time is normally sufficient). So, both laughing and sort of crying at the same time, after security I start running through the airport, shoes in hand “knowing” that I had missed my 3:00pm plane (now, 2:53pm). Just as I had lost all hope, I arrive at the gate and there is a handsome, 30-something airport gate attendant…our eye’s locked and I gave him “the face.” Next thing you know, I am beaming from ear to ear as I am the last person to take my seat. As the plane takes off I just start laughing histerically – disbelief, anger at my studpidity, and thinking what a great vagabunda story this will be on my blog! Rome was a 3-day whirl-wind adventure. I stayed with a local Italian couch-surfing host named Alessandro…a 30-something year old actor, working as chef to make ends-meet. He is a true believer in couch-surfing and has dedicated his whole front room for surfers – has three twin-beds spread out in different corners and more cots in the closet if needed (a nice couple from Russia were also staying there that weekend). My first night in Rome, Friday, Alessandro and I went straight to the grocery store to pick up the fixings for a great traditional Italian meal – fruits, vegetables, fresh pasta, beef and of course, a nice vino tinto. Alessandro’s comments on his couch-surfing profile page raved about his cooking and the man did not disappoint. Oh, and did I mention that Alessandro’s kitchen has also been transformed into a sort of couch-surfing scrapbook? 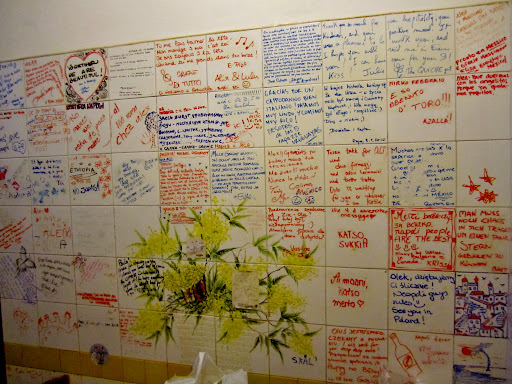 His kitchen walls are made of tile so he came up with this ingenious idea to have surfers write messages with dry-erase markers before they leave! What a fantastic idea! Also, he has a running tally going of how many surfers he has hosted and how many from each country – I was number #307!!! As for the Roman Collosseumand the Roman Forum, I highly, highlyrecommend that you get a tour guide or join a tour group. The minute I got off the metro I was approached by a tour guide company and I was of course, like a good tourist, scheptical and asked a lot of questions, but in the end I was 100% convinced and paid the 30€ for a 3 hour guided tour of the Colloseum, Roman Forumand the Palotino. So, why go for guided tours in Rome? Reason #1: You skip the outrageous lines! 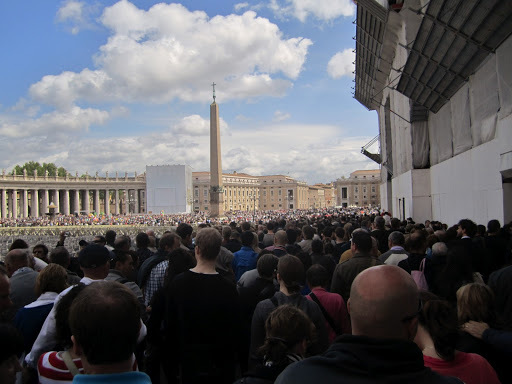 (We are talking about 3 hour lines that are wrapped around the Colloseum, probably even worse in the summer time…all groups with an official guide skip the line and go right in). Reason #2: Rome is obviously ,anciently old and is really a very fragile collection of old stones…nothing is labeled leaving you to decipher their meanings or to read your entire guide book from cover to cover. Having a knowledgeable tour guide explaining the legends and the history or even just to say, “Hey folks, this isn’t just a piece of stone…this used to be a part of…(etc)” can make all the difference in the world when visiting Rome. Reason #3: For all of you young, frugal, broke back-packers, I know spending the extra buck on a guided tour seems frivolous but the difference isn’t that huge to wait in line; I think the Colloseum was something like 12-15€ with the 3 hour wait, and the other Roman ruins were around 6€. Another quick tid-bit of shared information about guided tours (doing a little promoting here): I had a FANTASTIC tour guide named Jonathan – nice British guy, funny, charismatic and really knows his stuff about Rome. I had him for the second half of the tour in the Forumbut he does a bunch of different tours all over the city (including St. Peter’s Basilica, the Vatican Museums and private tours). If you’re in Rome, contact him and ask what tours he will be doing during the time you will be there (ask specifically for him), he is worth every penny! Oh yeah, and the Colloseum…it is pretty magnificent but in need of a lot of restoration. You know that famous quote, “While stands the Coliseum, Rome shall stand; When falls the Coliseum, Rome shall fall; And when Rome falls – the World.” So architects are saying that currently the 4thtier is dangerously unstable and could fall any day now…so, might want to get there soon folks if you’ve never seen it. However, in my opinion, the Roman arenas in Southern France are far more impressive than the Colloseum…much less visited and thus more intact/preserved. 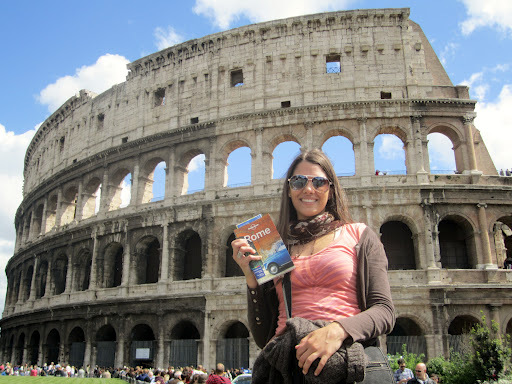 With my Lonely Planet: ROME guide book, I hustled all over the city trying to cross off everything on the list of “The Top 12 Things to Do in Rome,” making stops at the famous Trivi Fountainand Piazza di Spagna (more commonly known as the “Spanish Steps”). I met two nice 40-something year old sisters from Michigan, traveling through Italy for one of their birthdays. They advised me to rush over the Vatican Museum and St. Peter’s Basilicaand find a tour guide company because they let the last tour groups in at 4pm sharp and then they close the doors. The minute I arrived in front of St. Peter’s Basilica (line wrapped around the plaza of course) ,I was approached by a tour guide company and took the bait right away – 40€ to cut the lines, personal 3-hour guided tour of the Vatican Museums including the Sistine Chapel and St. Peter’s Basilica. Sounded like a good deal to me, not to mention my tour guide was BORN in Sacramento and grew up in the Bay Area (score!) We started with the Vatican Museums which were, for a “non-artsy” person, rather overwhelming. They say that, “If you spent one minute on every exhibit it would take you 12 years to see everything.” Mama mia! 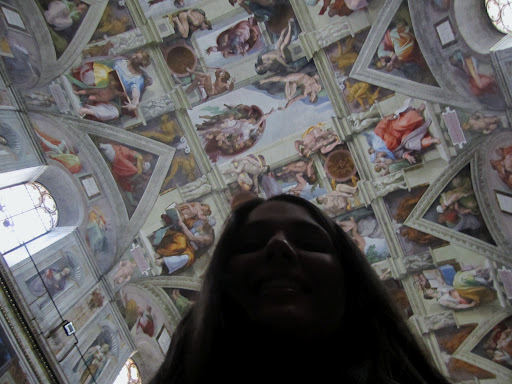 I got a bit of neck ache from awing over the Sistine Chapel for 20 minutes. (Little piece of interesting information: In contrary to what is commonly thought, Michelangelo didn’t lay on his back to paint the ceiling. He conceived and constructed a unique scaffolding system. It was sturdy enough to hold workers and materials, but began high up the walls of the chapel in order that Mass might still be celebrated below. The scaffolding curved at its top, mimicking the curvature of the ceiling’s vault. Michelangelo often had to bend backwards and paint over his head – an awkward position which must’ve made his neck and back ache, his arms burn painfully and, according to him, permanently affecting his vision). Sunday morning, I met my cool friends from Michigan in the Plaza of St. Peter’s Basilica and we snuck through the huge line just in time to make it for church service. I have been to a number of Catholic services in my life, but nothing like a traditional Sunday morning Catholic service, given in Italian, in THE St. Peter’s Basilica, in the middle of Rome. Not to mention while the Pope is taking his morning nap like 200 ft. away. Can’t get more holy than that! And might I just note that although the Sistine Chapel is exquisite, the Vatican Museums magnificent…theBasilica is absolutely jaw-dropping; dripping in silver and gold, 1,000 year-old perfectly preserved paintings, and marble mosaic floors. I also paid the 6€ to climb up to Michelangelo’s famous dome on top of the Basilica overlooking all of Rome (320 steps to be exact!). After Mass we all filed outside and gathered in the Plaza. As the Pope’s personal apartment faces the Plaza in front of the Basilica, it is supposedly a “tradition” that on Sunday mornings at noon, the Pope says a blessing and waves to everyone below in the Plaza. Well…he said his morning prayer (we could hear him over the loud speaker), but we (well I) never saw him. We had a rather side view of the window but if someone would have come to the balcony, I would have seen it! Maybe he was behind some sort of bullet proof glass or something? I wasted all of my camera battery waiting for him! Anyways, well, at least I have been blessed by the Pope. Does this mean I am clear of all my sins too?